Man, gotta get me some of those Putin brand puddings, is that one banana flavored? Wait isn't Big a russian quick noodle company? If you slathered this crap on a cracker would that be "Putin on the Ritz?" photoshoped joke. This pudding is not real. it says "if you are going to be racist, at least insult the right race dumbass"
It's not real. 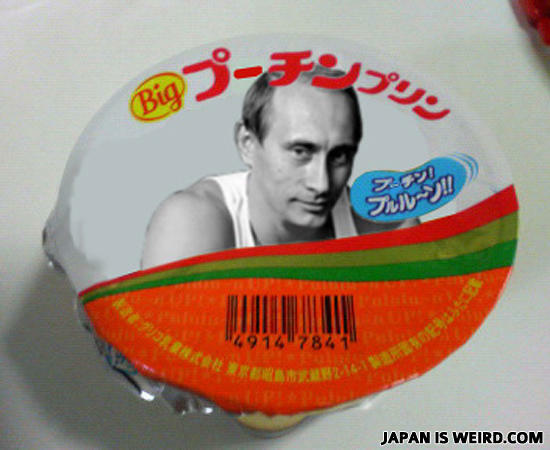 Big Pudding is a real product, but this was photoshopped because Putin and pudding sound alike in Japanese. i do not know who attached this picture on this web site. it is horrible. may be you will...oops i think somebody coming to my house and knocked the door.